Soft vinyl coated polyester mesh blocks 70% of the sun's damaging UV rays and protects the sensitive soft tissues of the eyes and face. 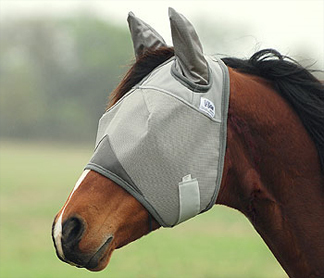 The forelock hole keeps the hair outside the mask and out of your horse's eyes. The cap of the mask is made from a soft, cool micro-mesh. Unique double dart stitching keeps the mesh away from the eyes and temples.